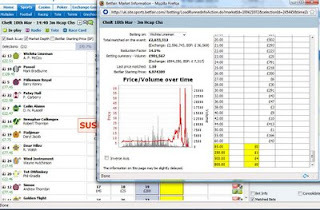 Knowing which horses lead, which horse swoop home late and which horses are just plain hard work for the jockey can make a big difference to trading in-running. Wichita Lineman is infamous for his running style, he can only win with a jockey like AP McCoy aboard, a jockey who keeps on pushing him hard. A novice jockey would be hopeless on this horse, he is extremely hard work, but when he gets going, then he flies home and wins, like he did today. The third-placed horse Nenuphar Collonges is quite similar, looks to be tired and going backwards, then he fights back and makes a race of it. Maljimar pipped at 1.05, Wichita Lineman matched as high as 60. Did I back him? No, I'm a layer in-running, but I did managed to lay 1.1 on the runner-up. Every little snippet of information who can store away for the future is valuable.